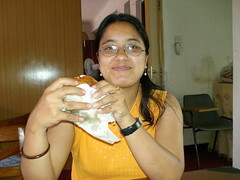 I have been primarily working with Sabina-ji at FTG Nepal. She has been my counterpart, as we work on the FTG Nepal website. I have been training Sabina on web development fundamentals, using Contribute to update content on their website, and last week we started looking at coding (X)HTML and CSS. In addition to all this, Sabina is very helpful and has been my key to navigating the Nepali office. Sabina is a great student and very fast learner. She is keenly interested in learning about web development and has been making great progress. As I’ve mentioned, we’ve already set up Contribute and made several updates to the FTG Nepal website. Sabina has also been working through HTML coding exercises and has been making great progress. As a matter of fact, this week I set up a testing subdomain for FTG Nepal and we got Sabina’s work posted. Learning to publish a web site is always fun, especially over dial up <grin>. We had the opportunity to see how case-sensativity can be a problem, especially when you develop on a Windows computer and then publish to a Linux server <smile>. Sabina is picking this material up very quickly, and is eager to get moving to Dreamweaver, something we’ll be starting today. I’m really quite proud, and very happy things are going so well. So congrats to Sabina-ji! You’re doing great work! I know its a little embarassing for her, but I can’t help but want to show you her work. Aside: I usually name this sort of domain dev.domain.tld – that’s the naming convention I’ve used for years, and it’s pretty standard in my part of the world. However, just as I was about to set this domain up, I remembered that “dev” in Nepali is a form of the word for “God”, like the temple near my office: Kandevsthan. So, I thought maybe I’d use something else, like “test” <smile>. sabina ji, great going. .. all the best.